WHERE THE HECK CAN I BUY THIS BOOK? you can SEARCH the INDEX NOW! Orders for the magnificent book, Timeless Home, the Sesquicentennial Celebration Book are now being taken. The price is $20, including tax. The graphically stunning book, 278 pages in length, is worthy of being read and kept on your library shelf. More than that, it is a keepsake to hand down to your children and grand children. 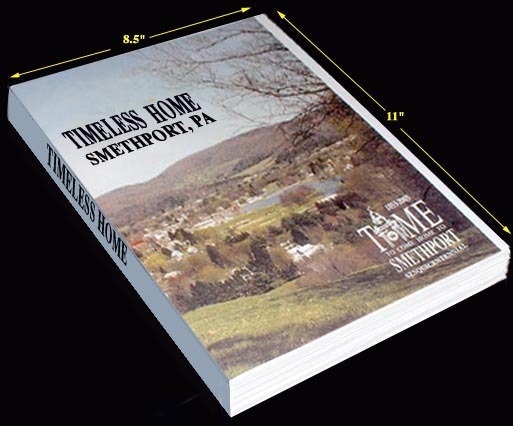 Editor Ross Porter and team Jim Herzog, David Johnson, Les Jordan, Jr., and Mary Pierotti have assembled the most thorough history of Smethport ever written, tracing our origins from early 1800ís through the "Community in Reniassance". The story is supplimented with 100s of historic photographs and dozens of exquisite modern color photographs by gifted Smethport photographer Les A. Jordan, Jr. 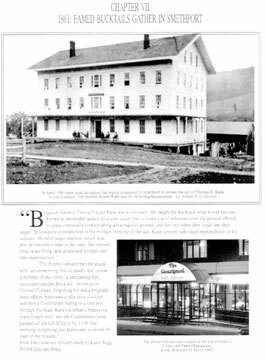 It also includes personal memories of various Smethport residents in a section entitled "Remember When" as well as congratulatory comments by the 141 patrons of the Sesquicentennial Celebration. The Hub of McKean County. Celebration of Independence Day 183O. 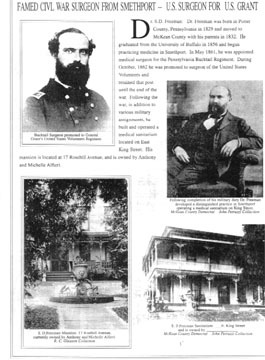 1853: Birth of the Borough. The Hamlin Lake Mill Pond. 1861 Famed Bucktails Gather in Smethport. Hamlin Ventures Alter Smethport History. Smethport’s Gilded Age Begins in 1880’s. 1900’s Boom Town—McKean County National Leader in Window Glass Manufacturing—J.C. 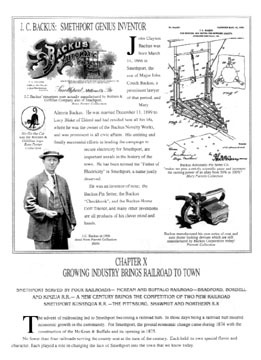 Growing Industry Brings Railroad To Town. The Fiber of the Community. Early Schools—The Original Smethport Academy—1893 Brick School—1900 School—Charles W.
A Long History of Champions. William Penn’s Holy Experiment—United Methodist Church—Smethport Baptist Church—St. Early Doctors—Modern Doctors—Bowman Health Center—Smethport Family Practice—James B. A Tribute to Our Organizations. Coast to Coast on US Route 6 —Remember When: School Days—Herbert W. Johnson/Leonard B.